We now come to King Henry the Eighth, whom it has been too much the fashion to call 'Bluff King Hal,' and 'Burly King Harry,' and other fine names; but whom I shall take the liberty to call, plainly, one of the most detestable villains that ever drew breath. You will be able to judge, long before we come to the end of his life, whether he deserves the character. He was just eighteen years of age when he came to the throne. People said he was handsome then; but I don't believe it. He was a big, burly, noisy, small-eyed, large-faced, double-chinned, swinish-looking fellow in later life (as we know from the likenesses of him, painted by the famous HANS HOLBEIN), and it is not easy to believe that so bad a character can ever have been veiled under a prepossessing appearance. He was anxious to make himself popular; and the people, who had long disliked the late King, were very willing to believe that he deserved to be so. He was extremely fond of show and display, and so were they. Therefore there was great rejoicing when he married the Princess Catherine, and when they were both crowned. And the King fought at tournaments and always came off victorious--for the courtiers took care of that--and there was a general outcry that he was a wonderful man. Empson, Dudley, and their supporters were accused of a variety of crimes they had never committed, instead of the offences of which they really had been guilty; and they were pilloried, and set upon horses with their faces to the tails, and knocked about and beheaded, to the satisfaction of the people, and the enrichment of the King. The Pope, so indefatigable in getting the world into trouble, had mixed himself up in a war on the continent of Europe, occasioned by the reigning Princes of little quarrelling states in Italy having at various times married into other Royal families, and so led to their claiming a share in those petty Governments. The King, who discovered that he was very fond of the Pope, sent a herald to the King of France, to say that he must not make war upon that holy personage, because he was the father of all Christians. As the French King did not mind this relationship in the least, and also refused to admit a claim King Henry made to certain lands in France, war was declared between the two countries. Not to perplex this story with an account of the tricks and designs of all the sovereigns who were engaged in it, it is enough to say that England made a blundering alliance with Spain, and got stupidly taken in by that country; which made its own terms with France when it could and left England in the lurch. SIR EDWARD HOWARD, a bold admiral, son of the Earl of Surrey, distinguished himself by his bravery against the French in this business; but, unfortunately, he was more brave than wise, for, skimming into the French harbour of Brest with only a few row-boats, he attempted (in revenge for the defeat and death of SIR THOMAS KNYVETT, another bold English admiral) to take some strong French ships, well defended with batteries of cannon. The upshot was, that he was left on board of one of them (in consequence of its shooting away from his own boat), with not more than about a dozen men, and was thrown into the sea and drowned: though not until he had taken from his breast his gold chain and gold whistle, which were the signs of his office, and had cast them into the sea to prevent their being made a boast of by the enemy. After this defeat--which was a great one, for Sir Edward Howard was a man of valour and fame--the King took it into his head to invade France in person; first executing that dangerous Earl of Suffolk whom his father had left in the Tower, and appointing Queen Catherine to the charge of his kingdom in his absence. He sailed to Calais, where he was joined by MAXIMILIAN, Emperor of Germany, who pretended to be his soldier, and who took pay in his service: with a good deal of nonsense of that sort, flattering enough to the vanity of a vain blusterer. The King might be successful enough in sham fights; but his idea of real battles chiefly consisted in pitching silken tents of bright colours that were ignominiously blown down by the wind, and in making a vast display of gaudy flags and golden curtains. Fortune, however, favoured him better than he deserved; for, after much waste of time in tent pitching, flag flying, gold curtaining, and other such masquerading, he gave the French battle at a place called Guinegate: where they took such an unaccountable panic, and fled with such swiftness, that it was ever afterwards called by the English the Battle of Spurs. Instead of following up his advantage, the King, finding that he had had enough of real fighting, came home again. The Scottish King, though nearly related to Henry by marriage, had taken part against him in this war. The Earl of Surrey, as the English general, advanced to meet him when he came out of his own dominions and crossed the river Tweed. The two armies came up with one another when the Scottish King had also crossed the river Till, and was encamped upon the last of the Cheviot Hills, called the Hill of Flodden. Along the plain below it, the English, when the hour of battle came, advanced. The Scottish army, which had been drawn up in five great bodies, then came steadily down in perfect silence. So they, in their turn, advanced to meet the English army, which came on in one long line; and they attacked it with a body of spearmen, under LORD HOME. At first they had the best of it; but the English recovered themselves so bravely, and fought with such valour, that, when the Scottish King had almost made his way up to the Royal Standard, he was slain, and the whole Scottish power routed. Ten thousand Scottish men lay dead that day on Flodden Field; and among them, numbers of the nobility and gentry. 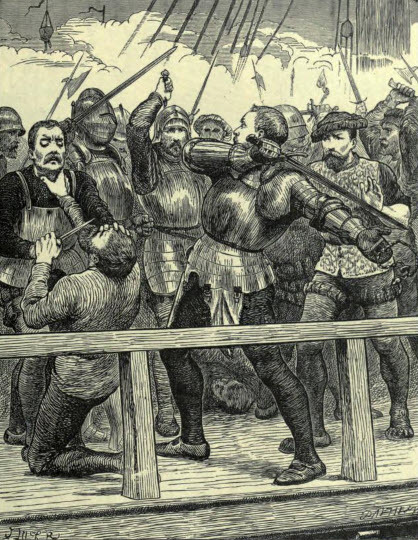 For a long time afterwards, the Scottish peasantry used to believe that their King had not been really killed in this battle, because no Englishman had found an iron belt he wore about his body as a penance for having been an unnatural and undutiful son. But, whatever became of his belt, the English had his sword and dagger, and the ring from his finger, and his body too, covered with wounds. There is no doubt of it; for it was seen and recognised by English gentlemen who had known the Scottish King well. When King Henry was making ready to renew the war in France, the French King was contemplating peace. His queen, dying at this time, he proposed, though he was upwards of fifty years old, to marry King Henry's sister, the Princess Mary, who, besides being only sixteen, was betrothed to the Duke of Suffolk. As the inclinations of young Princesses were not much considered in such matters, the marriage was concluded, and the poor girl was escorted to France, where she was immediately left as the French King's bride, with only one of all her English attendants. That one was a pretty young girl named ANNE BOLEYN, niece of the Earl of Surrey, who had been made Duke of Norfolk, after the victory of Flodden Field. Anne Boleyn's is a name to be remembered, as you will presently find. And now the French King, who was very proud of his young wife, was preparing for many years of happiness, and she was looking forward, I dare say, to many years of misery, when he died within three months, and left her a young widow. The new French monarch, FRANCIS THE FIRST, seeing how important it was to his interests that she should take for her second husband no one but an Englishman, advised her first lover, the Duke of Suffolk, when King Henry sent him over to France to fetch her home, to marry her. The Princess being herself so fond of that Duke, as to tell him that he must either do so then, or for ever lose her, they were wedded; and Henry afterwards forgave them. In making interest with the King, the Duke of Suffolk had addressed his most powerful favourite and adviser, THOMAS WOLSEY--a name very famous in history for its rise and downfall. Wolsey was the son of a respectable butcher at Ipswich, in Suffolk and received so excellent an education that he became a tutor to the family of the Marquis of Dorset, who afterwards got him appointed one of the late King's chaplains. On the accession of Henry the Eighth, he was promoted and taken into great favour. He was now Archbishop of York; the Pope had made him a Cardinal besides; and whoever wanted influence in England or favour with the King--whether he were a foreign monarch or an English nobleman--was obliged to make a friend of the great Cardinal Wolsey. 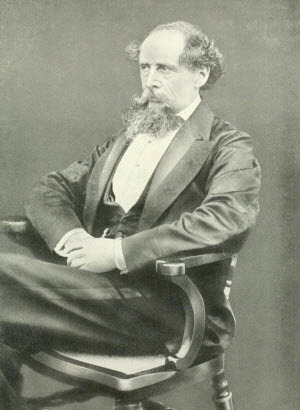 He was a gay man, who could dance and jest, and sing and drink; and those were the roads to so much, or rather so little, of a heart as King Henry had. He was wonderfully fond of pomp and glitter, and so was the King. He knew a good deal of the Church learning of that time; much of which consisted in finding artful excuses and pretences for almost any wrong thing, and in arguing that black was white, or any other colour. This kind of learning pleased the King too. For many such reasons, the Cardinal was high in estimation with the King; and, being a man of far greater ability, knew as well how to manage him, as a clever keeper may know how to manage a wolf or a tiger, or any other cruel and uncertain beast, that may turn upon him and tear him any day. Never had there been seen in England such state as my Lord Cardinal kept. His wealth was enormous; equal, it was reckoned, to the riches of the Crown. His palaces were as splendid as the King's, and his retinue was eight hundred strong. He held his Court, dressed out from top to toe in flaming scarlet; and his very shoes were golden, set with precious stones. His followers rode on blood horses; while he, with a wonderful affectation of humility in the midst of his great splendour, ambled on a mule with a red velvet saddle and bridle and golden stirrups. Through the influence of this stately priest, a grand meeting was arranged to take place between the French and English Kings in France; but on ground belonging to England. A prodigious show of friendship and rejoicing was to be made on the occasion; and heralds were sent to proclaim with brazen trumpets through all the principal cities of Europe, that, on a certain day, the Kings of France and England, as companions and brothers in arms, each attended by eighteen followers, would hold a tournament against all knights who might choose to come. CHARLES, the new Emperor of Germany (the old one being dead), wanted to prevent too cordial an alliance between these sovereigns, and came over to England before the King could repair to the place of meeting; and, besides making an agreeable impression upon him, secured Wolsey's interest by promising that his influence should make him Pope when the next vacancy occurred. On the day when the Emperor left England, the King and all the Court went over to Calais, and thence to the place of meeting, between Ardres and Guisnes, commonly called the Field of the Cloth of Gold. Here, all manner of expense and prodigality was lavished on the decorations of the show; many of the knights and gentlemen being so superbly dressed that it was said they carried their whole estates upon their shoulders. There were sham castles, temporary chapels, fountains running wine, great cellars full of wine free as water to all comers, silk tents, gold lace and foil, gilt lions, and such things without end; and, in the midst of all, the rich Cardinal out-shone and out-glittered all the noblemen and gentlemen assembled. After a treaty made between the two Kings with as much solemnity as if they had intended to keep it, the lists--nine hundred feet long, and three hundred and twenty broad--were opened for the tournament; the Queens of France and England looking on with great array of lords and ladies. Then, for ten days, the two sovereigns fought five combats every day, and always beat their polite adversaries; though they do write that the King of England, being thrown in a wrestle one day by the King of France, lost his kingly temper with his brother-in- arms, and wanted to make a quarrel of it. Then, there is a great story belonging to this Field of the Cloth of Gold, showing how the English were distrustful of the French, and the French of the English, until Francis rode alone one morning to Henry's tent; and, going in before he was out of bed, told him in joke that he was his prisoner; and how Henry jumped out of bed and embraced Francis; and how Francis helped Henry to dress, and warmed his linen for him; and how Henry gave Francis a splendid jewelled collar, and how Francis gave Henry, in return, a costly bracelet. All this and a great deal more was so written about, and sung about, and talked about at that time (and, indeed, since that time too), that the world has had good cause to be sick of it, for ever. The new war was a short one, though the Earl of Surrey invaded France again, and did some injury to that country. It ended in another treaty of peace between the two kingdoms, and in the discovery that the Emperor of Germany was not such a good friend to England in reality, as he pretended to be. Neither did he keep his promise to Wolsey to make him Pope, though the King urged him. Two Popes died in pretty quick succession; but the foreign priests were too much for the Cardinal, and kept him out of the post. So the Cardinal and King together found out that the Emperor of Germany was not a man to keep faith with; broke off a projected marriage between the King's daughter MARY, Princess of Wales, and that sovereign; and began to consider whether it might not be well to marry the young lady, either to Francis himself, or to his eldest son. There now arose at Wittemberg, in Germany, the great leader of the mighty change in England which is called The Reformation, and which set the people free from their slavery to the priests. This was a learned Doctor, named MARTIN LUTHER, who knew all about them, for he had been a priest, and even a monk, himself. The preaching and writing of Wickliffe had set a number of men thinking on this subject; and Luther, finding one day to his great surprise, that there really was a book called the New Testament which the priests did not allow to be read, and which contained truths that they suppressed, began to be very vigorous against the whole body, from the Pope downward. It happened, while he was yet only beginning his vast work of awakening the nation, that an impudent fellow named TETZEL, a friar of very bad character, came into his neighbourhood selling what were called Indulgences, by wholesale, to raise money for beautifying the great Cathedral of St. Peter's, at Rome. Whoever bought an Indulgence of the Pope was supposed to buy himself off from the punishment of Heaven for his offences. Luther told the people that these Indulgences were worthless bits of paper, before God, and that Tetzel and his masters were a crew of impostors in selling them. The King and the Cardinal were mightily indignant at this presumption; and the King (with the help of SIR THOMAS MORE, a wise man, whom he afterwards repaid by striking off his head) even wrote a book about it, with which the Pope was so well pleased that he gave the King the title of Defender of the Faith. The King and the Cardinal also issued flaming warnings to the people not to read Luther's books, on pain of excommunication. But they did read them for all that; and the rumour of what was in them spread far and wide. You recollect that Queen Catherine had been the wife of Henry's brother. What does the King do, after thinking it over, but calls his favourite priests about him, and says, O! his mind is in such a dreadful state, and he is so frightfully uneasy, because he is afraid it was not lawful for him to marry the Queen! Not one of those priests had the courage to hint that it was rather curious he had never thought of that before, and that his mind seemed to have been in a tolerably jolly condition during a great many years, in which he certainly had not fretted himself thin; but, they all said, Ah! that was very true, and it was a serious business; and perhaps the best way to make it right, would be for his Majesty to be divorced! The King replied, Yes, he thought that would be the best way, certainly; so they all went to work. If I were to relate to you the intrigues and plots that took place in the endeavour to get this divorce, you would think the History of England the most tiresome book in the world. So I shall say no more, than that after a vast deal of negotiation and evasion, the Pope issued a commission to Cardinal Wolsey and CARDINAL CAMPEGGIO (whom he sent over from Italy for the purpose), to try the whole case in England. It is supposed--and I think with reason--that Wolsey was the Queen's enemy, because she had reproved him for his proud and gorgeous manner of life. But, he did not at first know that the King wanted to marry Anne Boleyn; and when he did know it, he even went down on his knees, in the endeavour to dissuade him. The Cardinals opened their court in the Convent of the Black Friars, near to where the bridge of that name in London now stands; and the King and Queen, that they might be near it, took up their lodgings at the adjoining palace of Bridewell, of which nothing now remains but a bad prison. On the opening of the court, when the King and Queen were called on to appear, that poor ill-used lady, with a dignity and firmness and yet with a womanly affection worthy to be always admired, went and kneeled at the King's feet, and said that she had come, a stranger, to his dominions; that she had been a good and true wife to him for twenty years; and that she could acknowledge no power in those Cardinals to try whether she should be considered his wife after all that time, or should be put away. With that, she got up and left the court, and would never afterwards come back to it. The King pretended to be very much overcome, and said, O! my lords and gentlemen, what a good woman she was to be sure, and how delighted he would be to live with her unto death, but for that terrible uneasiness in his mind which was quite wearing him away! So, the case went on, and there was nothing but talk for two months. Then Cardinal Campeggio, who, on behalf of the Pope, wanted nothing so much as delay, adjourned it for two more months; and before that time was elapsed, the Pope himself adjourned it indefinitely, by requiring the King and Queen to come to Rome and have it tried there. But by good luck for the King, word was brought to him by some of his people, that they had happened to meet at supper, THOMAS CRANMER, a learned Doctor of Cambridge, who had proposed to urge the Pope on, by referring the case to all the learned doctors and bishops, here and there and everywhere, and getting their opinions that the King's marriage was unlawful. The King, who was now in a hurry to marry Anne Boleyn, thought this such a good idea, that he sent for Cranmer, post haste, and said to LORD ROCHFORT, Anne Boleyn's father, 'Take this learned Doctor down to your country-house, and there let him have a good room for a study, and no end of books out of which to prove that I may marry your daughter.' Lord Rochfort, not at all reluctant, made the learned Doctor as comfortable as he could; and the learned Doctor went to work to prove his case. All this time, the King and Anne Boleyn were writing letters to one another almost daily, full of impatience to have the case settled; and Anne Boleyn was showing herself (as I think) very worthy of the fate which afterwards befel her. It was bad for Cardinal Wolsey that he had left Cranmer to render this help. It was worse for him that he had tried to dissuade the King from marrying Anne Boleyn. Such a servant as he, to such a master as Henry, would probably have fallen in any case; but, between the hatred of the party of the Queen that was, and the hatred of the party of the Queen that was to be, he fell suddenly and heavily. Going down one day to the Court of Chancery, where he now presided, he was waited upon by the Dukes of Norfolk and Suffolk, who told him that they brought an order to him to resign that office, and to withdraw quietly to a house he had at Esher, in Surrey. The Cardinal refusing, they rode off to the King; and next day came back with a letter from him, on reading which, the Cardinal submitted. An inventory was made out of all the riches in his palace at York Place (now Whitehall), and he went sorrowfully up the river, in his barge, to Putney. 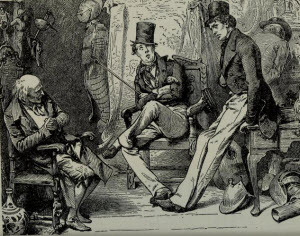 An abject man he was, in spite of his pride; for being overtaken, riding out of that place towards Esher, by one of the King's chamberlains who brought him a kind message and a ring, he alighted from his mule, took off his cap, and kneeled down in the dirt. His poor Fool, whom in his prosperous days he had always kept in his palace to entertain him, cut a far better figure than he; for, when the Cardinal said to the chamberlain that he had nothing to send to his lord the King as a present, but that jester who was a most excellent one, it took six strong yeomen to remove the faithful fool from his master. The once proud Cardinal was soon further disgraced, and wrote the most abject letters to his vile sovereign; who humbled him one day and encouraged him the next, according to his humour, until he was at last ordered to go and reside in his diocese of York. He said he was too poor; but I don't know how he made that out, for he took a hundred and sixty servants with him, and seventy-two cart-loads of furniture, food, and wine. He remained in that part of the country for the best part of a year, and showed himself so improved by his misfortunes, and was so mild and so conciliating, that he won all hearts. And indeed, even in his proud days, he had done some magnificent things for learning and education. 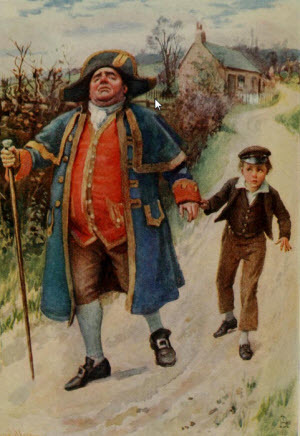 At last, he was arrested for high treason; and, coming slowly on his journey towards London, got as far as Leicester. Arriving at Leicester Abbey after dark, and very ill, he said--when the monks came out at the gate with lighted torches to receive him--that he had come to lay his bones among them. He had indeed; for he was taken to a bed, from which he never rose again. His last words were, 'Had I but served God as diligently as I have served the King, He would not have given me over, in my grey hairs. Howbeit, this is my just reward for my pains and diligence, not regarding my service to God, but only my duty to my prince.' The news of his death was quickly carried to the King, who was amusing himself with archery in the garden of the magnificent Palace at Hampton Court, which that very Wolsey had presented to him. The greatest emotion his royal mind displayed at the loss of a servant so faithful and so ruined, was a particular desire to lay hold of fifteen hundred pounds which the Cardinal was reported to have hidden somewhere. The opinions concerning the divorce, of the learned doctors and bishops and others, being at last collected, and being generally in the King's favour, were forwarded to the Pope, with an entreaty that he would now grant it. The unfortunate Pope, who was a timid man, was half distracted between his fear of his authority being set aside in England if he did not do as he was asked, and his dread of offending the Emperor of Germany, who was Queen Catherine's nephew. In this state of mind he still evaded and did nothing. Then, THOMAS CROMWELL, who had been one of Wolsey's faithful attendants, and had remained so even in his decline, advised the King to take the matter into his own hands, and make himself the head of the whole Church. This, the King by various artful means, began to do; but he recompensed the clergy by allowing them to burn as many people as they pleased, for holding Luther's opinions. You must understand that Sir Thomas More, the wise man who had helped the King with his book, had been made Chancellor in Wolsey's place. But, as he was truly attached to the Church as it was even in its abuses, he, in this state of things, resigned. Being now quite resolved to get rid of Queen Catherine, and to marry Anne Boleyn without more ado, the King made Cranmer Archbishop of Canterbury, and directed Queen Catherine to leave the Court. She obeyed; but replied that wherever she went, she was Queen of England still, and would remain so, to the last. The King then married Anne Boleyn privately; and the new Archbishop of Canterbury, within half a year, declared his marriage with Queen Catherine void, and crowned Anne Boleyn Queen. She might have known that no good could ever come from such wrong, and that the corpulent brute who had been so faithless and so cruel to his first wife, could be more faithless and more cruel to his second. She might have known that, even when he was in love with her, he had been a mean and selfish coward, running away, like a frightened cur, from her society and her house, when a dangerous sickness broke out in it, and when she might easily have taken it and died, as several of the household did. But, Anne Boleyn arrived at all this knowledge too late, and bought it at a dear price. Her bad marriage with a worse man came to its natural end. Its natural end was not, as we shall too soon see, a natural death for her.